"That is a very nice uneven bow...way to go guys! (This is exactly how I directed it)"
After many hours in our 15-passenger van, Director of Education and The Tempest director, Sarah Carlson-Brown, was finally able to interview our lovely Chloe Armao, who plays Miranda in the show. The conversation is below. If you are a visual person, imagine in the driver's seat (Chloe) and passenger seat (Sarah), flying at 76 mph toward Oshkosh, NE. The occasional youtube video being played in the background and Nickleback on the radio... Chloe's choice. "Miranda comforting Prospero, Ferdinand looks on." CHLOE: WELL HI! I am Chloe Armao, born in Montana, but raised in Denver, Colorado. I graduated from The University of Minnesota/Guthrie Theatre BFA Actor Training Program, and I am currently based out of Minneapolis, Minnesota. I am SO excited to be working with Nebraska Shakespeare for the first time, and also to be on my first educational tour! Woo Hoo! CHLOE: I did graduate in May! It is definitely intimidating to enter the “real world” after college, particularly when entering the strange and difficult theater industry. I have to say I have found life after school to be both terrifying and totally exhilarating. I went to an arts school for middle school and high school, as well as studying theatre intensively in college. So even when it is a little challenging, I can’t tell you how amazing it feels to actually be doing what I have studied for half of my life! SARAH: How did you hear about and get involved with Nebraska Shakespeare? "Chloe commanding the stage with Sonnet 43"
CHLOE: The BFA program that I graduated from brings in a host of theatre companies, Shakespeare companies in particular, to audition us in our third and fourth year. So it was last February that I met and auditioned for Vincent (artistic director) in Minneapolis. Not only does this company have a reputation for doing great work, and a strong connection to the Omaha community, but I also heard great things from a friend of mine who was in Titus Andronicus and Twelfth Night two summers ago, so I jumped at the chance to be a part of this company. "Gonzalo gifts. Stuffs and Necessaries." CHLOE: Here is my list of past Shakespeare productions: Much Ado About Nothing, Pericles, Macbeth, Julius Caesar, and now The Tempest! I am a bit of a Shakespeare nerd (truth be told) so all of the plays that I have been a part of are in some way my favorite... 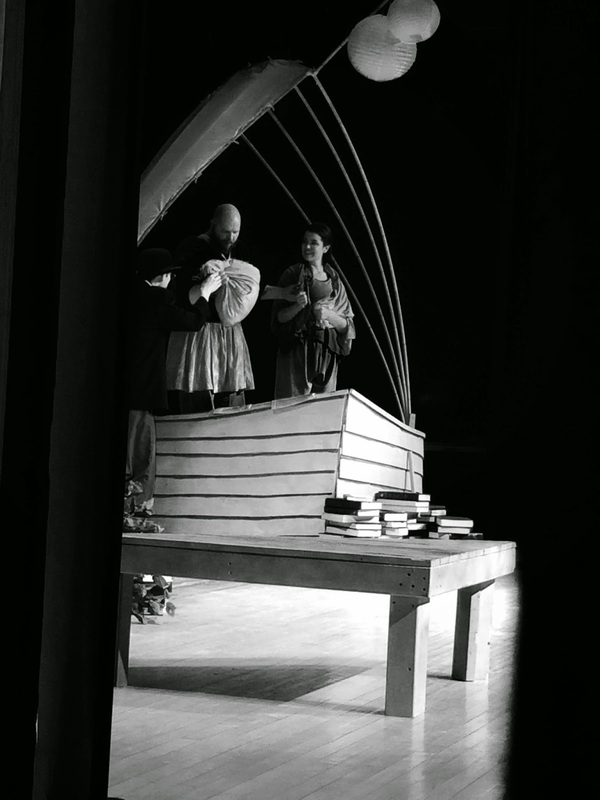 Honestly though, this production of The Tempest holds a special place in my heart for many reasons. In the past, The Tempest has been one of the more difficult plays in the canon for me to connect to. It is categorized as a "romance," somewhere between a "comedy" (where everyone gets married and lives happily ever after) and a "tragedy" (where everyone dies at the end). On top of that, there are many characters and several overlapping plots. Before this production I have never found myself connecting to the humanity of these extreme characters in this extreme reality. The way that this production cuts through to the heart of Prospero’s struggle with forgiveness is really powerful, and the way that each character’s story is told with such specificity has made me really fall in love with this play. SARAH: I believe I heard that you have a “must do” list for your time in Omaha. Is this true? What have you done so far? What is still on the list? "Chloe at Vala's. She was chosen to cheer for the purple pig!" CHLOE: YES! I have a pretty long list actually! So far I have purchased Husker’s gear, been to Vala’s Pumpkin Patch, and eaten at some pretty great restaurants, just to name a few! The big thing that is still on my list is to go to the Omaha Zoo. I have heard that it is one of the best in the country and I can’t wait to go!! CHLOE: Good question. Hmmm… Well, this summer I tried a really delicious coconut Popsicle at an art fair in Minneapolis, so I think that might be my new favorite. "Chloe takes a well deserved nap during the show. I am sure she is so comfortable on that tiny wooden bench." SARAH: Coconut!? I need to move to Minneapolis. So, you play Miranda in this tour of The Tempest. Talk a bit about Miranda’s story in a nutshell. What are some challenges you faced when approaching the work? CHLOE: Miranda is a young woman who has been shipwrecked on an island with her father for the last twelve years of her life, basically as long as she can remember. She has grown up isolated from any other human contact, but has been tutored by her father. The shipwreck of her uncle and the King of Naples sparks a life-changing moment when she meets Ferdinand (the King’s son) and instantly falls in love. "Miranda teaches Caliban to read...it doesn't go very well." One of the challenges is definitely trying to understand and embody Miranda’s almost alien understanding of the world. Her reality is obviously so far from my own in that she has grown up in such isolation, but as the rehearsal process continued, more and more similarities arose. For me, it has come down to finding the balance in Miranda. She is both an intelligent, well-read, strong young woman and a wide-eyed girl who greets the new experiences she encounters in the play with openness and curiosity. CHLOE: Oh my, yes I did! The timing of the storm could not have been better as we were in the middle of rehearsing the storm scene from the top of the show. I remember it was raining so loud at one point that we couldn’t even hear each other in the scene! In the aftermath, the parking lot looked like the wild waters of Prospero’s sea storm. It was epic. "As props load-in coordinator, Chloe sets all props on and off stage. Here, she is working on the banquet cloth." SARAH: Do you have a favorite moment from the show, or something you think people should look for when they see the show? CHLOE: I honestly have such a great time doing this entire show; it is really difficult to choose just one moment! One thing that keeps coming up for me as we have been on tour is that though Miranda’s relationship with Ferdinand in the play is really important (and it is always super fun to be head-over-heels in love on stage), it is Miranda’s relationship with her father Prospero that I hope will also resonate with our audiences. It is a journey of independence from a father, as well as a process of discovering one’s own path for their life. I know that I can absolutely relate to that. During the wedding scene, there is a “giving away of the bride” moment when Prospero and Miranda have a final hug, and I think it is such a full moment. Rites of passage into adulthood are really complicated and that entire scene captures the joy, anticipation, and loss that accompanies growing up. yet for some reason I refuse to call on her." CHLOE: Well, there are just so many amazing people on this tour with such great answers in talk-backs, so I don’t blame you! I think that one of the reasons to take theatre to schools, besides hopefully giving a really positive experience of beautiful literature, is that we give them an opportunity to use their imaginations. I think that this production asks a lot of our audiences, in a really good way. We challenge them, no matter the age, to believe in our magical island, to follow our heightened language, but mostly to really care about what is happening with these characters. This is a challenge that I have seen audience after audience rise to so far on this tour, and I could not be more proud to be a part of it. Thanks Chloe for your time and thoughts. It is an honor to watch you work. "Working with a student in our mask workshop in Oshkosh, NE"
Come see Chloe and the whole cast of The Tempest in our community performances this upcoming weekend. 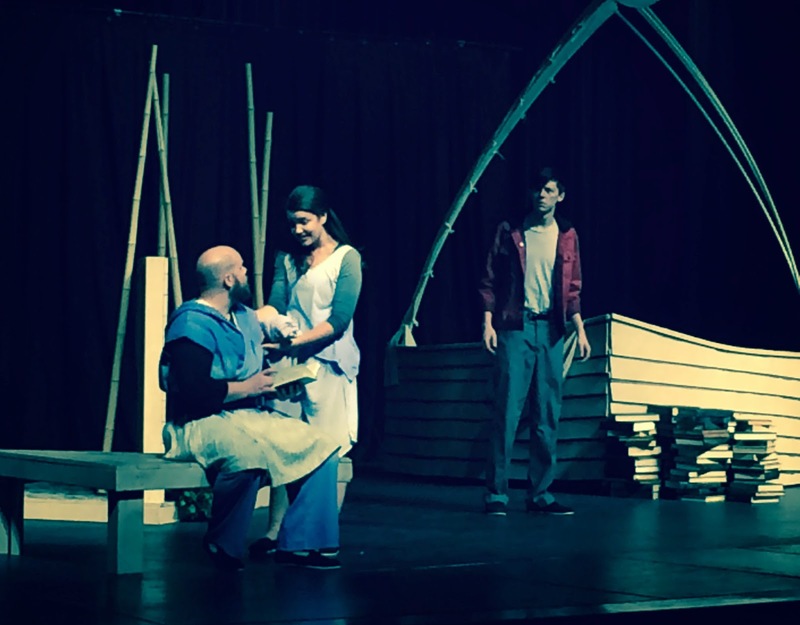 Nebraska Shakespeare’s production of The Tempest is part of Shakespeare in American Communities, a program of the National Endowment for the Arts in partnership with Arts Midwest.